When the news about a new album got out, expectations from both fans and critics were high. With Ray Of Light, Madonna has re-invented herself again as a spiritual woman, expressing her feelings after the birth of her daughter. But she also set a high standard now. However, if anyone can top the success of Ray Of Light, it would have to be Madonna! And again she took a whole new direction. She strayed away from the spiritual, multi-layered Ray Of Light. This album was recorded late 1999, early 2000. Although it was ready by early summer, the release got pushed back because of Madonna's pregnancy with Rocco. In the meantime, only few official reports were released, giving wild rumours free play. Several names for the album circulated, 'Epiphany' being one of the best known. Also many fake tracklistings got around. One of the things that Madonna revealed was that she had collaborated with Ray Of Light-producer William Orbit again. In 1999, Orbit said they had worked on several songs, which had some similarities with the previous album. But Madonna isn't into repeating herself, so she hooked up with French producer Mirwais to work on a new sound. From both recording sessions, 3 Orbit-songs and 6 Mirwais-songs were selected. A tenth track was produced by Guy Sigsworth. Rumours about collaborations with Salt 'n Pepa and others proved to be just that - rumours. However, it seems true that a track was recorded with Sasha, but it was cut from the album. Music, Madonna's 8th full length studio album, was released worldwide on September 19, 2000. The original 10-track version was only available in the US. For Europe there was a bonus track; American Pie, which originally appeared on the soundtrack of The Next Best Thing. Asia and Australia got a second bonus track called Cyber-raga. This new track was one of the cuts from the album, resembling Shanti/Ashtangi, the Sanskrit song from Ray Of Light. There's also a limited edition, in four different colors. This version is a booklet with the Music shield on a hard cover. It contains more inside pictures than the original, but the disc is the same. During the Drowned World Tour there was also a special tour edition, featuring the original disc plus an extra disc with remixes and the video for What It Feels Like For A Girl. None of the album editions provided lyrics; they were only available on Madonna's official website. The title track, though leaked on the Internet months before its release, was an incredible success. It topped the charts pretty much everywhere, something that hadn't really happened worldwide since 1990's Vogue. 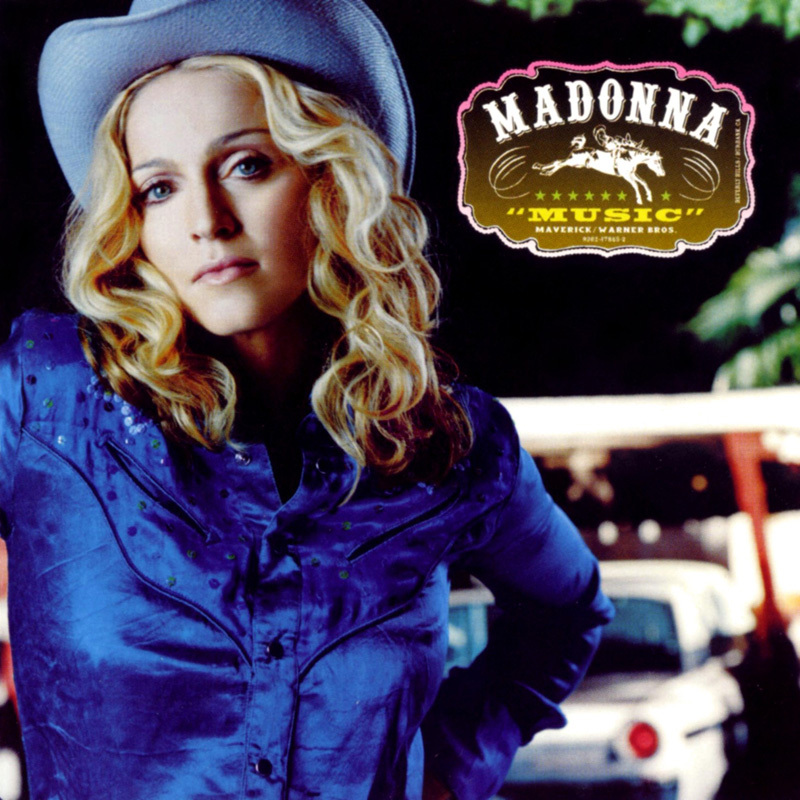 Where Music had the image of the ghetto-fabulous gangsta-diva, the second single Don't Tell Me elaborated on the album's cowgirl-theme and in What It Feels Like For A Girl Madonna appears as a violent nihilistic chick. Impressive Instant is the forgotten single; though very promising it never got a commercial release. Big mistake, because the promo with the Rauhofer remixes topped the Hot Dance/Club Play chart for two weeks, which also means the album had four #1 dance singles. Music was a hit on the album charts, debuting on #1 in Canada, France, Germany, UK and US. In its first week, 420,000 copies were scanned in the US, at that time it was the fourth-highest debut among female artists since May 1991. To this date, it has sold 11 million copies. In November 2005, it was triple Platinum in the US, while in February 2002 it was recertified 5 times Platinum in the UK.